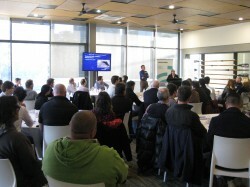 Presentations are now available from Clearwater's recent partnership event with Stormwater Victoria: WSUD Asset Management – Defining the Problem. The session consisted of two council presentations and a 90 min interactive workshop. Participants were guided through a problem definition toolkit where they had the opportunity to work through a real life problem on WSUD Asset Management. The event was well attended by a range of disciplines spanning from sustainability officers and engineers through to asset managers, parks and garden teams. Anne and Peter's presentation explored some of the key challenges being faced by the City of Greater Geelong on WSUD Asset Management. Key challenges were presented across the entire life cycle of an asset from design through to maintenance. They concluded with how they were tackling some of these challenges and what were some of the key outcomes. Sam's presentation provided a practical approach to some of the key challenges being faced by the City of Port Philip on WSUD Asset Management. His presentation details a key council project, Streetscape WSUD Design Review, which assesses the condition of their WSUD assets to identify maintenance and rectification needs, priorities and opportunities to improve future designs, procedures and capability. A write up of this event has been produced and available in the supporting documents section.